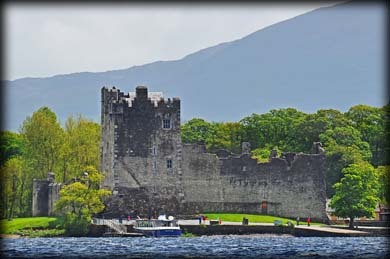 Built on top of a limestone outcrop on the eastern shore of Lough Leane, this four storey tower house dates to the late 15th century. It was formerly the ancestral home of the ODonnoghue clan, but is better known for it's association with the Browne's of Killarney. The tower was converted into a barracks in the 17th century and has undergone several structural changes since. The north side of the bawn wall can be seen in the top image with it's two circular corner towers. The west wall and much of the east wall were mostly rebuilt. The castle contains 16th and 17th century oak furniture and is open to the public from early March to mid-October. 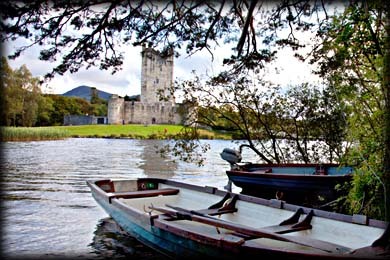 There are boat trips from here to Innisfallen. Situated: From Killarney head south on the Muckross Road (N71). After 170 metres turn right onto Ross Road. Then 800 metres turn right into the car park. Discovery Map 78: V 9493 8880. Last visit May 2013.